This page covers Finline basics and provide advantages and disadvantages of Finline. Finline supports combination of both TE and TM modes instead of quasi TEM mode. Due to less dispersion, wider bandwidth and high Quality factor can be achieved compare to microstrip lines. It operates from 25 to 100GHz with loss of about 0.1 dB /wavelength. The finline construction is shown in the figure. It offers higher characteristic impedance on the order of about 20 to 400 Ohm. The higher losses can be compensated by using ridged waveguide of same size as of finline. There are two variants of finline, viz. bilateral finline and antipodal finline. 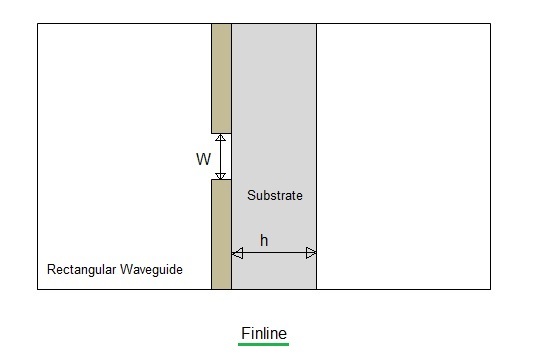 • guide wavelength in finline is greater than guide wavelength in microstrip line. • assembly is relatively complex.